Inspired by personal frustration with having to carry, locate or interpret numerous legal documents on various formats, I decided to look into a digital, more convenient alternative. 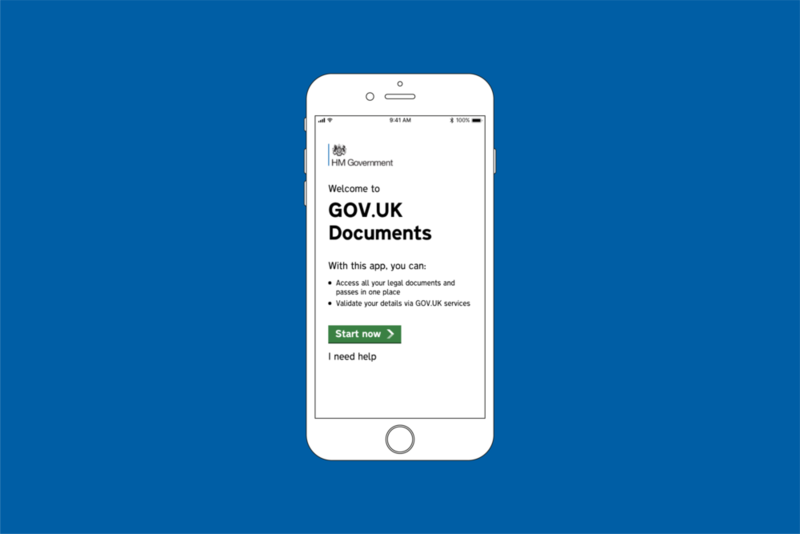 I designed and built a prototype for an smartphone app I called GOV.UK Documents. Here I go through the whole process from inception to prototype delivery. At present, almost all documents issued by the government are physical items that can easily be lost, damaged or stolen and used maliciously. Passports, driving licences, national insurance cards are just some examples. We have to remember where they are, we have to sometimes interpret information from their various outdated formats and we have to remember to take them with us. In other words, there's just too much conscious thinking involved. Of course, just because I had frustrations with the current system, that doesn't necessarily mean it's an issue shared by others. I wanted to understand how big an issue this actually was and who it mattered the most to. I spent some time browsing the internet, looking for comments and even projects centred around this issue. 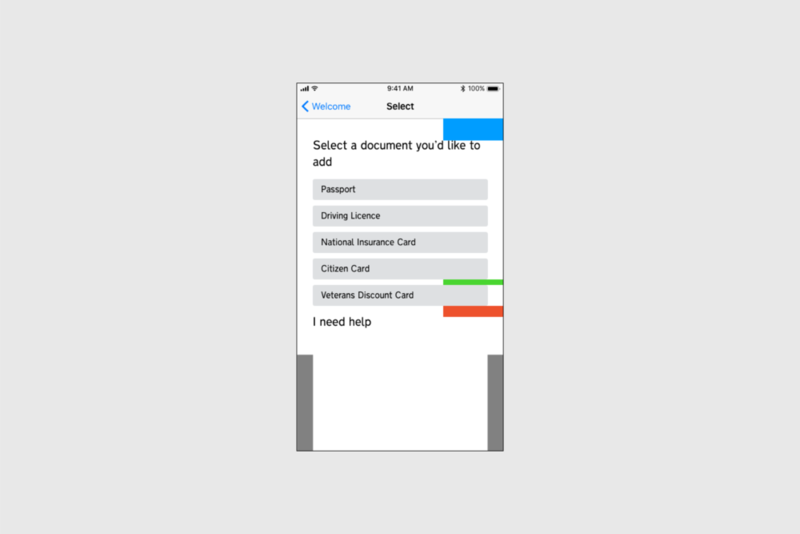 It turned out that the DVLA were already working on bringing UK Driving Licences to Apple Wallet, Apple's digital pass facility built into iOS. Their CEO Oliver Morley tweeted a photograph in 2016 of a prototype. In addition, DeLaRue, the company that prints UK bank notes and passports, has declared that it too is working on a paperless alternative to passports. For some people, digital solutions simply aren't an option, at least for now. Reasons include limited technical knowledge, feeling intimidated by some modern technologies and a lack of funds. With this in mind, GOV.UK Documents can for now only work as an optional alternative rather than a compulsory, direct replacement for traditional documents. It would most likely be adopted first by younger citizens, probably somewhere between the ages of sixteen and thirty years old. Some early adopters will fall outside this catchment. In time, others would hopefully see the benefits and if possible, make the switch. Encouraging and helping others to get on board over time will be key to ultimately going digital in years to come without leaving people behind. Once I'd established what people would want from an app of this nature, I began sketching out ideas which were then developed into wireframes. Being the start of first-time users' journeys, I began with the welcome screen. This screen would establish the visual tone of the app. It had to give users enough information to move forward but not overwhelm them before they had even had a chance to try the app out. After experimenting with a number of initial layouts, I settled on a welcome screen that would be split into three rows. 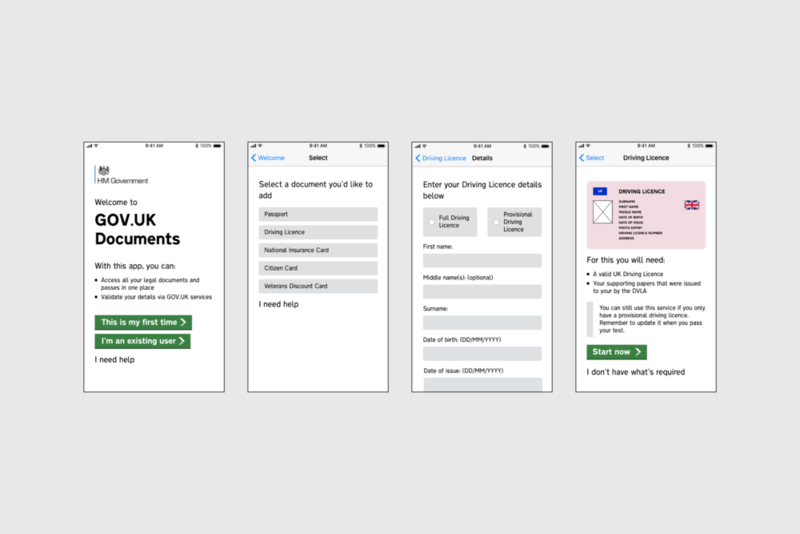 The top row contained the HM Government crest, the middle row contained the GOV.UK Documents title and some info and the bottom row contained action buttons leading users into the app. I decided that the app should either mirror the look of the GOV.UK website or at least feature the HM Government crest. With any facility like this, it's important that users know they can trust the content in it. I started work on a digital prototype based on my drawings and wireframes. I decided to use a relatively new piece of software from Adobe called Experience Design (XD). At the time of writing the product is still in Beta, but after trying it out I knew that it contained all the features I would need to build the prototype. I was able to quickly put together a library of assets to use throughout the prototype, saving considerable time later. These included assets such as text-styles, colour swatches and action buttons - all set in the style of the GOV.UK website. As I was working to quite a tight schedule, I decided to focus on one smartphone platform, Apple's iOS. I chose this platform chiefly because I have easy access to my own iPhone for testing purposes. This application could of course also be developed for Android and Windows 10 Mobile in reality. Ensuring the app had a clear, functional layout was a major priority. The reason the GOV.UK website works so well is primarily down to the absence of clutter and decoration. It's all about the necessities. The information should inform everything else. Aesthetic elements such as typography and spacing were a key focus-point when building the prototype. Guidelines were put together to ensure structure and hierarchy throughout the app. The type had to be consistent with the GOV.UK website to maintain familiarity for users, large enough to be read by users with less-than-perfect eyesight but small enough to work well on smaller devices like the Apple iPhone SE and some Android handsets for example. To see how the first prototype would perform when used by people that have no prior knowledge on how it works, I set up a small scale testing process with members of my immediate family. Even with a very small pool of testers, four in total, it was invaluable watching people use the prototype to get an understanding of what worked and what didn't. The age range was 20-48, quite narrow in comparison to a typical comprehensive user test. There was however a wider ranger of technical knowledge across the pool. It was also good practice with regards to organising user testing sessions, interpreting feedback and making any alterations to the product based on the feedback. 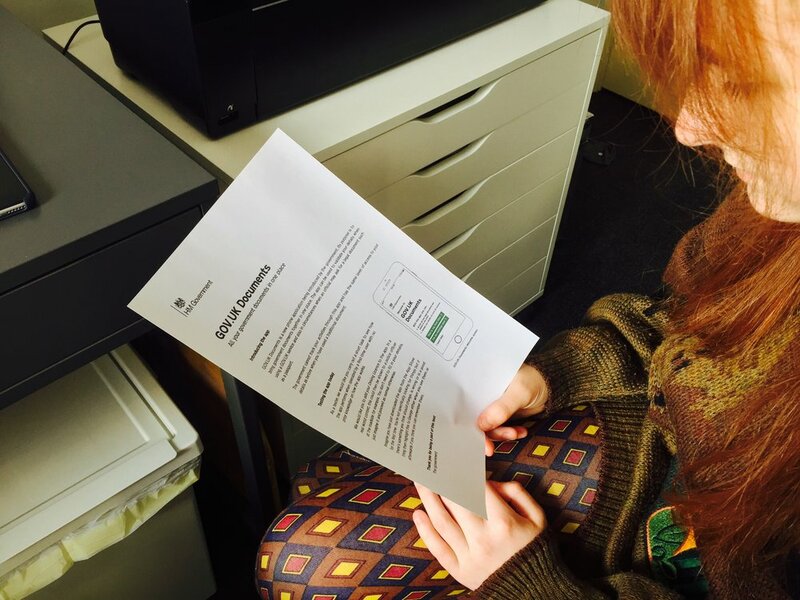 Each tester was given a sheet containing an introduction to the app, a preview of the welcome screen and a short task that they were asked to complete. This ensured everyone was given the exact same information to start off with. A smartphone running the prototype was then handed to them so they could attempt to complete the task outlined on the sheet. A stopwatch was used to time each user. I then asked questions about their technical ability on a scale of 1 - 10, what they liked about the app, what they disliked and anything they may have found confusing along with miscellaneous comments. Feedback for the app was good and the prototype performed well with all four testers. Everyone liked the concept and wanted it to become a genuine service. Credit must of course be given to the Government Digital Service who designed the visual language of the GOV.UK website, on which this app's interface is based. At least one of the testers mentioned how important security was to them with an app of this nature. With this in mind, I think it would be beneficial to include more emphasis on the security measures in place such as Touch ID when welcoming people to the app for the first time. For the second iteration, I experimented with a number of changes. Some based on comments made to me during user testing and some devised by myself based on my own tests. If I was working on this project for a longer period of time, I would carry out a second round of user testing to analyse how the changes to the prototype perform. This would then inform any further changes. This iterative testing would continue until I feel the app is ready to be tested on a larger scale with more users. As outlined in my research, I do think an app of this nature would be widely adopted by many over time. Starting with those who already have what is required, followed by those who are currently either put-off or simply unable to use such technology at the present time. It's particularly important at this early stage in my career not to have (too many) delusions of grandeur, especially when this was a self-initiated project. I haven't changed the world with this project. I didn't have the pressure of the unsympathetic public following my every move armed with pitchforks or department budget constraints for example. I did however give myself creative limitations in order to become a more disciplined designer. I gave myself a week to complete the project and every decision, as always, was a user-centred one. I utilised the people around me and some of the tools I had at my disposal. The aim of this project was to put into practice the skills and school of thought I have been pursuing over the last few years as both a university student and an independent designer. GOV.UK Documents was simply an outlet for this and whilst I do believe that in the real world the app could be a viable service, my own personal learning experience was always the true goal of the project.